The project was so unlikely from the start. Two musicians from different worlds met on a flight to Norway. A renowned orchestra traveled to California, allowing for a spontaneous recording session. Call it extraordinary serendipity. 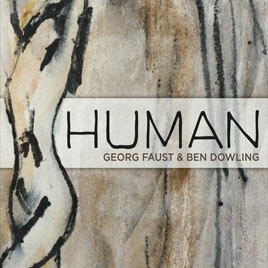 Human is a collection of improvisations from Berlin Philharmonic principal cellist Georg Faust and jazz pianist Ben Dowling. It is a magnificent celebration of heart within an ocean of understanding. It is healing music of profound sensitivity and gentle touch. It was an accident of history. The New World enticed so many different people to its shores, that there were few alternatives. Either there would be a hundred different countries established on this new continent—with the attendant war and conflict—or somehow people would figure out a way to live together. We opted for the second of those. While it probably doesn't seem like this would help - let's face it - if you are unwilling to play a lot of wrong notes, you're never going to learn how to do anything hard. It isn't something that you can do safely, with the assurance that you will look good while trying to get good at it. You won't look good. You won't sound good -- and the sooner you realize this, the sooner you will be able make real progress.